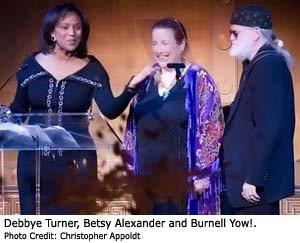 Well, Betsy and Burnell went to the 2007 DogCatemy Awards Gala in New York last night. Three videos were in the running for “Best Musical.” One of them was the piece that Debbye Turner did about me for the CBS Early Show a while back. And guess what? We won!! B & B joined Debbye at the podium to accept the award on my behalf. I don’t travel very well, so I stayed home and mostly slept. Anyway, now it’s on my piano. Debbye got one too. Katie Lee Joel, Billy Joel’s wife, was one of the presenters, and she told everyone that Billy loves me. In fact, according to what my mom told me, he’s obsessed with me, and likes to watch my videos a lot. Maybe someday I can play a duet with him. That would be fun. Wouldn’t it? A lot of people there had seen my videos. I kind of wish I was there, but I heard there were a lot of dogs there, and so maybe I’m glad I stayed home. Congratulations, Nora! You deserve it!